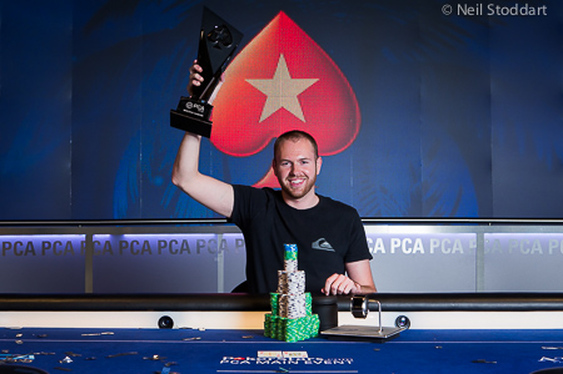 He may have started the session in the shadows of Chance Kornuth, but by the close of play Kevin Schulz was able to move from second place and onto the winner's podium to collect the 2015 PCA Main Event title. In a contrast to last year's PCA finale which took 16 hours to complete, this year's contest was done in just six hours thanks to a storming performance by Schulz in the latter half of the showdown. Following a few early eliminations, Schulz was able to capitalise on a rush of cards while the chip leader, Kornuth, stalled. Seemingly unable to get a slice of luck, Kornuth eventually lost his footing and slipped from his lofty position at the top of the chip chart and into the danger zone. Indeed, after Schulz eliminated Germany's Niklas Hambitzer in fourth place he took a commanding lead and used that to press home his advantage. With Schulz rising and Kornuth falling, a clash between the two forces was inevitable and when the latter moved all-in with Ad 8d he found himself sweating a decisive showdown against the former leader. Although Kornuth's hand was superior to Schulz's Ah 4s, the poker gods had made up their minds about who was to be blessed with luck and as the board ran out things quickly changed. After watching an As Jd 5c 3h emerged, Kornuth already feared the worse, despite still being the statistical favourite. Unfortunately for him, those fears were soon confirmed after the 2s on the river gave Schulz the hand and another high profile scalp. Now holding a 4:1 chip lead going into the final battle, Schulz had to survive a few early scares against Diego Ventura before making a hero call to clinch the title. After watching his Peruvian opponent check-raise all-in on the river, Schulz was forced to study the Qs 6d 4h Kc 6c board before making his decision. After going into the tank for a few minutes, Schulz eventually called with Kh 3d and was delighted to see Ventura show Td 4d for the weaker hand. As the realisation of his achievement began to sink in, Schulz was mobbed by his friends, including Faraz Jaka, before he was presented with the 2015 PCA winner's trophy and a bankroll boosting $1,491,580.